Mobile HowTheMarketWorks is now live! You can now easily trade on the go with a completely mobile-optimized interface for trading, managing your portfolio, doing research, and everything else you could want on HowTheMarketWorks! Right now, if you log in with a tablet, we’ll still direct you to the full site, but if you’re using a smaller device we’ll take you to the mobile version. Trading and managing your portfolio should be the same experience in both places, but with smoother and cleaner layout for small screens. 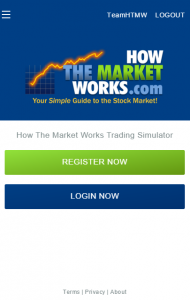 Get those thumbs moving and start trading on mobile today! As always, we’ve been making many smaller updates and enhancements every week, so happy trading!